Running is a very popular way to exercise because of its efficiency. It is a high intensity workout that burns 90% more calories than walking (1); running also helps to strengthen the muscles surrounding knees when done correctly. Improper form as a runner can lead to a variety of health issues down the road. Physical therapy offers more than just corrective measures after an injury. With the AlterG treadmill, a therapist can see your form and help you correct it. This article will explore how the AlterG treadmill works. Why was the AlterG treadmill invented and how does it work? In the 1990s, Dr. Robert Whalen, needed a way to help astronauts prepare for extended stays on the space station. He patented gravity differential technology in 1992 and licensed it to a company named AlterG (2). With the help of his son, Sean, they created the AlterG treadmill. It works by adding air pressure to lift you off of the treadmill (3). As you are lifted off, you “lose” a percentage of your body weight; anywhere from 20 to 80% of your body weight (4). While you are running, the physical therapist is watching carefully to see how your foot lands, your knee and hip positioning, and force with which you land (5). If they notice your feet turn out for example, they can ask you to focus on turning your feet in while on the AlterG. In turn, that prevents increased foot strain and helps you avoid injuries like shin splints, plantar fasciitis or medial knee pain (6). The can also suggest other alterations such as asking you to change stride length, the part of the foot you land on, and the force you and with in order to decrease pain and prevent injury. Where can you find an AlterG treadmill? Many universities, professional teams and NASA have AlterG treadmills for students, athletes and astronauts. 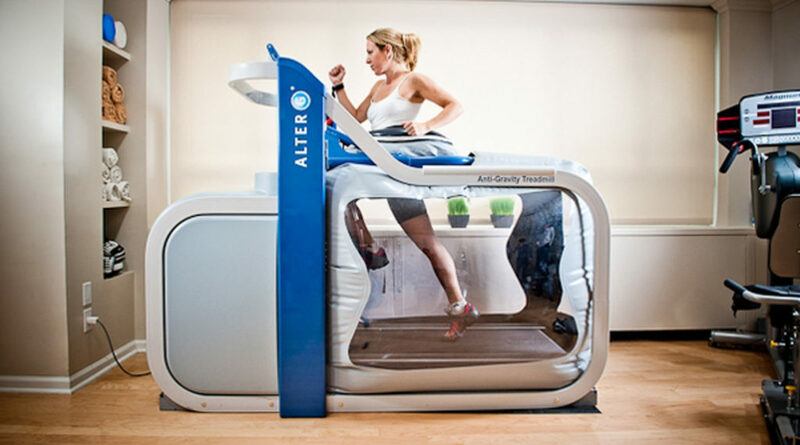 If you are a runner and live around South Philadelphia and want to use an AlterG to learn if your technique is correct or to rehabilitate an injury, you can call Atlantic Physical Therapy at 215-271-4100. Most insurances cover AlterG for rehabilitative purposes as part of a physical therapy program. If you would like to independently use the Alter to practice running in a decreased gravity state, Atlantic Physical Therapy offers a 30 minute session for $25 or 3 session packages for $50.